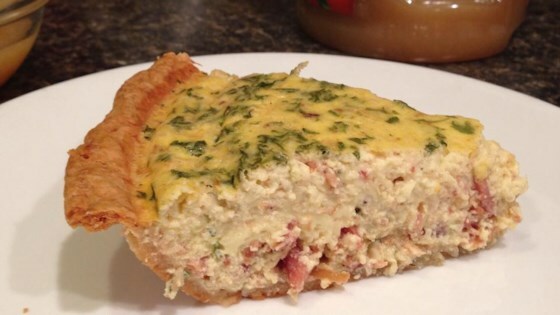 "I discovered quiche Lorraine while studying French in high school. After trying many recipes over the years and being dissatisfied with each one I have put my own spin on this classic recipe that results in a crisp crust and tender custard. Serve with a side salad if desired. Bon appetite!" Place bacon in a large skillet and cook over medium-high heat, turning occasionally, until evenly browned, about 10 minutes. Drain bacon slices on paper towels; crumble. Reserve about 2 tablespoons bacon drippings in the skillet. Cook and stir onion and garlic in reserved bacon drippings over medium heat until onion is softened, 5 to 10 minutes. Place thawed pie crust in a pie dish; prick holes in the bottom and sides of crust using a fork. Bake crust in the preheated oven until lightly browned, about 8 minutes. Remove crust from oven and reduce oven temperature to 325 degrees F (165 degrees C). Whisk half-and-half and sour cream together in a bowl; beat eggs into half-and-half mixture. Mix Swiss cheese, salt, black pepper, and cayenne pepper into half-and-half mixture; add bacon, onion mixture, and parsley. Pour mixture into the crust. Bake in the preheated oven until a knife inserted into the center of the quiche comes out clean, about 45 to 50 minutes. Cool for 10 minutes before slicing into wedges. Depending on your oven you may wish to line the rim of the crust with aluminum foil to prevent excessive browning. I felt this recipe was rather bland. I only made it because I had the ingredients listed. Both my husband and I ended up putting hot sauce on it. I will not make it again. No change . Easy and delicious. Pair good with fresh fruit. Grade A+++. My family devoured it. This was a delicious recipe. I made it with a homemade quiche crust. I wanted to eat it all for dinner but I saved enough for lunch the next day. Easy recipe to make. I brushed a tablespoon of Dijon mustard onto the crust before adding the other ingredients. Good with a salad for Sunday brunch.